Freestyle motocross rider, Travis Pastrana, completed three iconic jumps in tribute to the late Evel Knievel. (KGTV) – Freestyle motocross rider, Travis Pastrana, will pay tribute to Evel Knieval by recreating three of the late legend's most-iconic jumps Sunday night at Caesars Palace live on the History Channel. 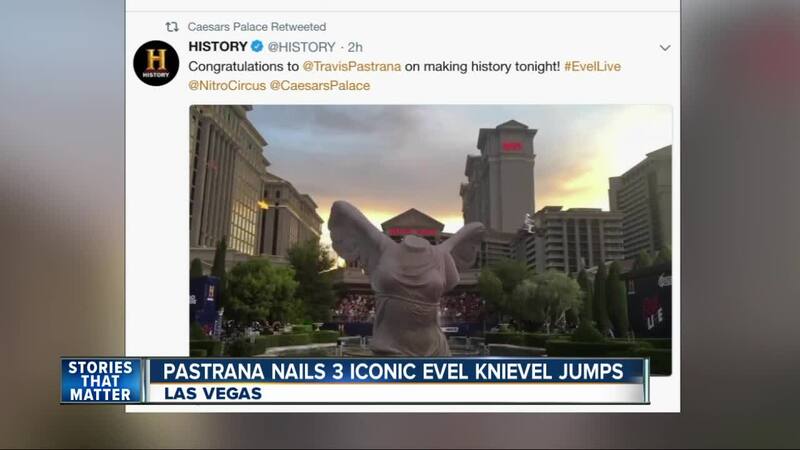 The event, 'Evel Live' will be televised July 8th at 5 p.m. and will feature Pastrana jumping a v-twin motorcycle over 50 crushed cars, 16 Greyhound buses, and the famous Caesars Palace fountain that nearly killed Knievel 50 years ago. #ad We get inside the head of @travispastrana as he prepares to attempt three of @officialevelknievel’s most iconic jumps. Watch #EvelLive July 8 on @history! Pastrana entered the action sports scene when he placed gold at X Games in 1999 at 15 years-old, and has since then go onto land the first double back flip on a dirt bike and tours the world performing stunts with Nitro Circus . Pastrana will attempt the jumps on a modified Indian Scout FTR750 , a modern-day flat track bike similar to the type of motorcycle Knieval used to jump, which are heavier than modern motocross bikes. "I got on the Indian [Scout] and it was like, 'Holy cow, it's like jumping a tank.' Now I understand why Evel crashed so much," Pastrana told the AP in an interview. Indian Motorcycle of San Diego will be hosting a live watch event on the big screen July 8th at 5 p.m., and will feature food provided by Burros and Fries, raffles, games, prizes and more!